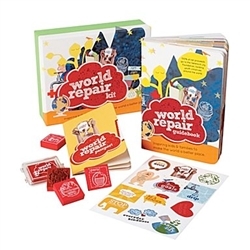 The World Repair Kit is a compact little box that contains do-gooder tools and activities, making volunteering and contributing a fun activity. 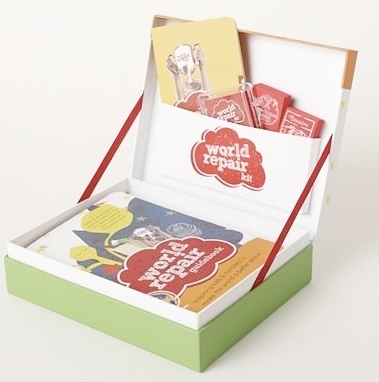 Everything you need to make the world a better place, all in one box! * Quick facts about environmental issues, conservation, protecting endangered species and more. * Hands-on ways to help those in need of food, shelter, clean water, education and health care. * Great ideas for volunteering, planning creative fundraisers and hosting World Repair Parties. * A Resource Guide connecting you to amazing non-profit organizations. * Everyday ways to find your passion and get inspired to be the best world citizen you can be! 205-page guidebook, passport with ink pad + four activity stamps to help you track your journey, reminder stickers to spread the positive message. Published by Chronicle Books. Most components printed on FSC-certified paper. Recommended for ages 8-108! 7.5 x 6.5 x 2"